If you live on the East Coast, then chances are pretty good that your January 23rd SAT just recently became your February 20th SAT. That’s a bummer, no? Then again, maybe you’re happy—you’ve just been given a whole extra month to study. My suggestion: take advantage. I was planning on taking my Math Guide and Essay Guide out of print today, but now that they’re relevant for a small group of you for another month, I’ve just slashed their prices instead. If you don’t have my books, yet, and you’ve just found out you have more time than you thought to get ready, I invite you to grab them at your favorite online retailer at a deep discount. Here they are at Amazon—my favorite online retailer. I’ve received a few questions in my email asking about the Beta I’m running (full info here). Specifically, people want to know what they get if they sign up. I figured that the best way to answer that question is just to post one of the chapters up here in public. If you join the Beta, you get access to chapters of the new book as I finish them just like you’ll see below. You also get the opportunity to, if you spot a typo, submit it to me in exchange for a $5 gift card. Registered Math Guide owners can already access the Beta for free. For everyone else, it’s $16.99. When the actual book is released, paying Beta customers will be able to buy it at a big discount. 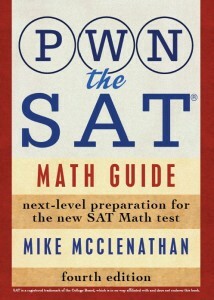 As many of you know, I’ve been working for some time now on putting together a Math Guide for the new SAT. It’s been slower going than I’d hoped, but I am making progress despite the fact that this is in many ways a ground-up rewrite. I’m at a place now where I’m keen to start sharing some things and getting feedback from you guys. So, today I’m officially launching the Beta program, through which you’ll be able to read the book as I continue to write it. Here are the important details. The Beta will officially end on March 5, the first day the new SAT is given. When the Beta ends, Beta memberships will convert to Math Guide owner memberships. When the physical book is finally available for sale, everyone who paid for Beta access will receive a code to purchase the book at a discount. If you spot a typo and report it to me (a misspelling, a missing negative sign, a grammar mistake) I will reward you with a $5 Amazon gift card. There is no limit to how many of these you can get. If you spot 10 errors, you’ll end up with $50 in gift cards. At the time I’m writing this (11/21/15), there are 13 chapters available, plus solutions to all the drills in those chapters. By the end of this week, I expect there will be 14 or 15 chapters available. After that, well, I am just going to keep working until it’s done. Come along for the ride! Click here to join the Beta! Already in the Beta? Click here to go to it! The new SAT will occasionally ask you questions about experimental design—whether the results of an study conducted by some students, for example, can be generalized to an entire population, or whether some experimental intervention has a causal impact. These questions will not be rocket science, and will not require any math at all, even though they’re in the math section. They will require some critical thinking and careful reading, though. They will also require you to be on the lookout for randomization. Generally speaking, the more randomized an experiment is, the stronger the conclusions that can be drawn. If you’re doing research, and you want to be able to generalize your findings over an entire population, then you have to randomly select the subjects for your experiment from that entire population. Say you want to know, on average, how likely a new driver in the United States is to have an accident within one year of getting his or her driver license. If you want to be able to generalize your findings to the entire population of new drivers in the United States, then you need to do a random selection from that whole population. That’s not going to be easy to do, of course, but good research is hard! If you want to generalize about all new drivers in the US, you’re going to have to find someone who has the data you need. Maybe start calling the Department of Motor Vehicles in every state, or car insurance companies. If you tried to take the easy way out and just went to your local shopping mall and asked the first hundred 17-year-olds you saw whether they’d been in an accident in the first year of having their licenses, then you could really only generalize your findings about the population of new drivers who visit that mall. Maybe going to that mall requires driving on a highway, which not every new driver in the country does. Maybe that mall is in a city, where people are more likely to get into a fender bender than new drivers who live in rural areas. Maybe people who shop in malls are more likely to get into car accidents than people who do most of their shopping online. You see? Things get a bit more complicated when you’re dealing with experiments in which an intervention of some kind occurs. If you want to be able to generalize your results to an entire population, you need to select randomly from that population. If, further, you want to be able to argue that some intervention is causing some difference between experimental groups, you need to make sure that the intervention is assigned to subjects randomly. Again, in practice, this is not easy to do. That’s why good research is valuable: it’s hard to do! Say a cognitive scientist is trying to determine whether a certain intervention can be used to cause infants to exhibit object permanence earlier than they usually do. Say, further, that this researcher managed to obtain a truly random sample of infants (this is very difficult, since parents would need to sign off on such a thing, and maybe there’s some difference between children of parents who would sign off and children of parents who wouldn’t…). If the data shows that babies who received the intervention did, on average, exhibit object permanence earlier than those who did not receive the intervention, the cognitive scientist could only claim that the intervention caused the accelerated object permanence if the babies given the intervention were selected at random. Holy cow—that’s a lot of text about this stuff! My longwindedness notwithstanding, though, experimental design questions really aren’t hard—I promise. Just remember: if the question you get asks you to find a weakness in the design of an experiment, chances are very good that the answer will be something that’s obviously not random. Remember that we use statistics to make generalizations about large populations based on observations we make of small groups from those populations. The small groups we use (randomly, if we’re doing it right) are called samples. The number of members of the sample is called the sample size. Generally speaking, the bigger the sample size, the more likely it is that it’s representative of the whole population. Experimental design and interpretation questions on the SAT will usually provide a sample size. In the released tests, there’s no question where a too-small sample size is an experimental design problem, but I suppose it’s possible that something like that could appear in the future. Rule of thumb: if your sample size is bigger than 100, it’s probably fine. Only consider sample size a problem if it’s comically small. This kind of question will also sometimes make mention of a study’s margin of error or confidence interval. If you’ve taken a statistics course, then you’ve probably had to calculate these things. You’ll never have to do that on the SAT. You’ll just have to know, in the most basic sense, what they are and why they’re important. When we generalize what we’ve observed in a sample to draw a conclusion about an entire population, we have to remember that there’s a small possibility that we’re wrong. For example, after measuring the heights of 300 randomly selected 33-year-old American males, we might say that we are 95% sure that the true average height height of 33-year-old American males is within 3 inches of the 70 inch average we found. 3 inches is our margin of error, 67 to 73 is our confidence interval. As our sample size increases and we become more confident that the sample is representative of the population, our margin of error and confidence interval will shrink: we’ll be able to, with the same level of certainty, that the average we’re finding is closer and closer to the true population average. One more thing: the 95% in this example is called the confidence level—you’ll probably only ever see confidence levels of 95% (maybe 99% once in a while). We include a confidence level to acknowledge that, even if we’ve designed our study carefully—randomized properly, made sure our sample size was sufficient, etc.—it’s mathematically possible that our sample just won’t represent the overall population well. Which ordered pair satisfies the system of equations above? There are a bunch of good ways to solve such a problem, and I think you should know all of them. So, I’m going to talk about all of them. That’s what you come here for, after all. So, there you have it. Choice A is for sure the answer: is a solution for that system of equations. Substitution is the classic, the mainstay. Most people know how to do it and are comfortable with it. Elimination, to my constant amazement, seems less universally known. I say to my amazement because elimination is awesome. Cool, right? Unsurprisingly, because math works, we landed on the same answer with both methods. But we’re not done yet, folks. There are still more ways to solve a system of linear equations! 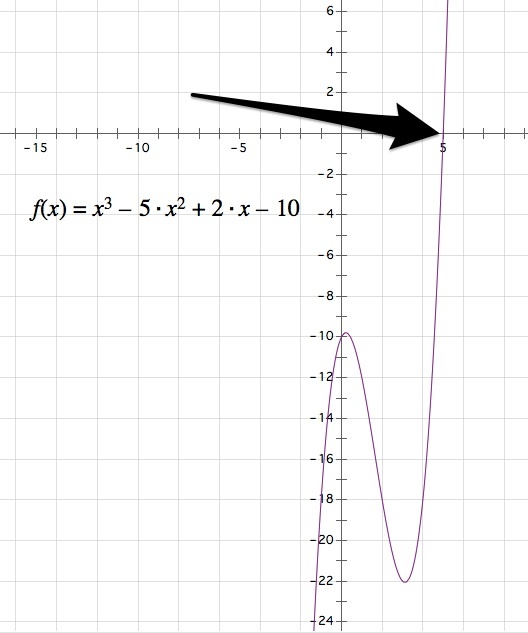 Always remember, as you’re taking the SAT, that when two graphs intersect, they do so at a point that is a solution set for the two equations that make those graphs. If you’re in the section where calculators are allowed (and with the numbers in this question we’re playing with, you would be), then you have still more weapons for solving systems of equations at your disposal. Let’s look at that question again. Pop those into your calculator and graph! If your window is currently set to standard zoom, you’ll probably only see one line. You should expect this to happen from time to time—the writers of the SAT would love to see you doing the algebra, not taking graphing shortcuts. Try zooming out a bunch by setting your window to go from –100 to 100 in both axes, instead of the standard –10 to 10. Finally, a multiple choice question like this can be solved by backsolving. All you have to do is try answer choices by making sure they work in both equations. Only the correct answer choice will result in true outcomes when substituted into the given equations. Nope—that’s not true at all! Yep again! That’s a good answer. When you hit ENTER and get 21, which is what the question said you should get, then you know that ordered pair works for that equation. Think you’ve got all this? I bet you do. But just so that we can both sleep a little better tonight, why don’t you try a few more questions. Because this is practice and all, you might consider trying to solve all of these questions all 4 ways. As I said in my last post, I’m busy working on the new edition of the Math Guide for the new SAT. Here’s another quick pair of graph questions for you to try out. You don’t need to be a site member to take this little quiz, but I’d encourage it. Site membership is free, and if you’re logged in all the quizzes you take will be stored. If you take enough of them, that adds up to useful data for you to see where your strengths and weaknesses are. The next two questions refer to the following information. Prepping for the new SAT? Try this. I’m in full-on writing mode for the next edition of the Math Guide, which will of course be aimed at the new SAT that debuts March 2016 (and the new PSAT, which debuts in October of this year). The new test is pretty different, so it’ll be a major overhaul—some chapters in the current guide will go away, other chapters will be brand new. Obviously, that means lots of new questions to write. To that end, I’ll be posting practice questions on the blog with some regularity over the next few months. This will hopefully benefit those of you who are already prepping for the new exam. Your feedback will also help me fine-tune the questions for clarity and difficulty. It’s a win-win! Anyway—here’s a question pair for you to play with. You don’t need to be a site member to take this little quiz, but I’d encourage it. Site membership is free, and if you’re logged in all the quizzes you take will be stored. If you take enough of them, that adds up to useful data for you to see where your strengths and weaknesses are. 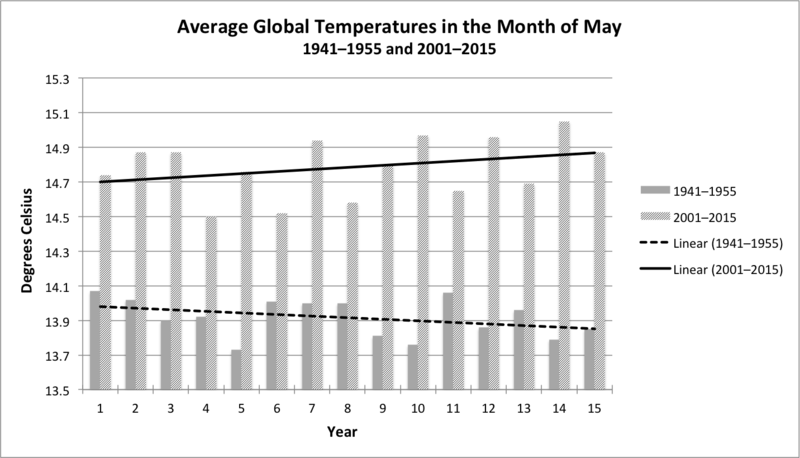 Data source: GISTEMP Team, 2015: GISS Surface Temperature Analysis (GISTEMP). NASA Goddard Institute for Space Studies. Dataset accessed 2015-06-15 at http://data.giss.nasa.gov/gistemp/. The order of the math sections on the new SAT should really be switched. (1 of 3) After taking the tests that have been released, it occurs to me that there’s a notable flaw in the design of the new #SAT. (3 of 3) subset of test takers) it will be easy to remember a tough question that would be easy with a calc until the next section. Am I missing something here? To me, this falls somewhere between not-a-huge-deal and kinda-a-big-deal. Of course, the nature of the paper SAT has always enabled people willing to risk being caught cheating to keep thinking about a question after time is called and revisit it during the next section, but now what you have is a section where calculators are prohibited followed immediately by a section where calculators are allowed. That’s a bit tricky without a calculator, no? But it’s a 2-second problem if you graph it. The function is at 0 when x = 5. No factoring or tricky algebra necessary. This is one of the hardest questions in the no calculator section. If they know they’ll have their calculators and be able to graph the equation just a few minutes later, some kids are going to memorize the equation (or just flip back to it surreptitiously) and graph it when they get their calculators. What boggles my mind about this issue is that it goes away if the calculator section comes first. I have to assume it wasn’t just a random choice to put the sections in the order they’re in, but I can’t imagine why this particular decision was made. This kind of thing is going to be featured much more heavily on the new SAT than it is on the current one, so I figured I’d put a quick quiz together. Struggling with any of these? Discuss them in the comments! For each of the items below, choose the mathematical statement that is equivalent to the given sentence. The College Board has released, at long last, its first full practice test since announcing sweeping changes to the PSAT and SAT last year. You may now finally, if you’re one of a small group of merry misfits that actually enjoy this kind of thing, sit down for 3 hours and take a prototype test from start to finish. Then you can correct it. You cannot, however, score it yet. Unsurprisingly, College Board still hasn’t fully figured out how it’s going to scale these things. You can download the test here, and the answer key and explanations here. Believe it or not, the answer document is longer than the test document. Anyway, I just spent 3 hours of my beautiful Sunday afternoon with this thing, so I figured I’d jot down a few of my initial reactions in bullet form. At an hour long, the reading section is a real slog. And it’s the first thing students will do. As advertised, there’s less emphasis on tough vocabulary. The passages, for the most part, feel familiar. Many of the questions would be just as at home on the current SAT. The stuff that’s new is…fine, I guess. The questions that ask students to select the best justification from the passage for their previous answer are annoyingly formatted. Because the sections from the passage aren’t recreated in the choices—it’s the familiar old SAT-format, e.g. Lines 7–9 (“Thanks . . . life”)—there’s a LOT of necessary flipping back and forth. The graphs that appear seem tossed in after the fact, without much thought put into integrating them into the passage. I guess the “Great Global Conversation” piece in this test is the excerpt from Carnegie’s “Wealth”? Two thoughts: 1) Blech. 2) Students with some contextual knowledge of Carnegie’s life will be at an advantage answering those questions. Strong readers will probably welcome the changes—they’ll need to worry much less that, despite their comprehension skills, they might encounter vocabulary words they don’t know on test day. Weak readers will be at a disadvantage, but, well, it’s a reading test. The writing is, basically, ACT writing. I know I’m not making an original observation here, but there’s just no other way to describe it. In this one test, the difference between their, they’re, and there, AND the difference between its and it’s are both tested. Something I unsarcastically do love is an emphasis on clear, concise prose over both colloquialisms and awkward usage of fancy words. 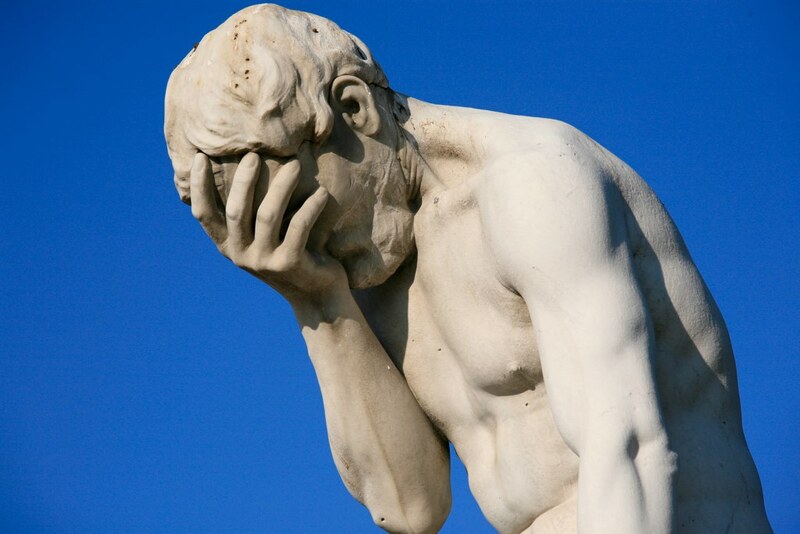 In one question, a student must choose between “prosaic directives,” “simple directions,” “bare-bones how-tos,” and “facile protocols.” I am fully on board with discouraging people from using phrases like “prosaic directives” and “facile protocols” whenever possible. Right off the bat, it’s obvious this test is different—more information is supplied on the first page than there used to be. Formulas for the volume of a sphere, the volume of a right cone, and the volume of a right pyramid are now provided. Also, the note that used to say that all numbers on the test are real numbers now says: “All variables and expressions used represent real numbers unless otherwise indicated.” This sample PSAT contains no spheres, cones, pyramids, or imaginary numbers, but they’re fair game now. It’s probably too early to say this, but the answer choices seem less intentionally devious. On one question, I rescued myself from forgetting a negative sign because the answer I arrived at wasn’t a choice. Phew! The old SAT might not have been so kind. The “Heart of Algebra” questions that come early in the section are kinda fun, if you know what you’re doing. With the exception of one basic trigonometry question, a question about graphing inequalities, and the last two question about shooting an arrow in the air (more on that later), pretty much everything in this test felt like it could have been fair game on the last test. This surprised me a bit, but it probably shouldn’t have. I didn’t start working in test prep until a year after the last big change in 2005, but I’m told that the same thing happened—early promises of a revolution were greatly exaggerated. Then again, it’s early yet. My friend Akil worries that the calculator allowed/no calculator allowed sections will result in unfairness, or at the very least confusion; I agree with him to an extent. However, I liked that I was forced to solve some questions by hand that I normally would have turned to my calculator for. It’s good to work out unused muscles. There are still only 8 grid-in questions, but now they’re split among the two math sections—4 in the no calculator section, and 4 in the calculator allowed section. It’s possible that there isn’t a stronger emphasis on the advanced topics showcased in previous question releases because this is a PSAT and they’re actually going to start saving the tough stuff for the SAT. We’ll have to wait and see on that one. The last two grid-ins come as a pair—two questions about the same mathematical scenario. In earlier released questions, we were shown questions about a traveler dealing with exchange rates and bank fees—pretty tough stuff. Here, we’re dealing with an arrow being shot from the ground, which is tough stuff if you haven’t taken physics yet, but pretty standard if you have. What was interesting to me about the questions, though, was the amount of information provided that you don’t need at all. You are given 3 equations, and you need only one of them—the same one—to answer both questions. The old SAT wouldn’t have done that. We’ll have to keep an eye on how often the new one will. Even though very little information has been released to date—not even a full practice test yet!—I’m hard at work trying to get a head start on the next iteration of the Math Guide for the new SAT (coming about a year from now—March 2016). When I write questions, I have a very hard time keeping them to myself, so if you’re curious what I’m thinking some of the tougher topics the new SAT might throw at you will look like, well, they might look something like this. How’s everyone else doing on this quiz? I guess I’d better start writing some practice questions for the new SAT, huh? The five questions in this short quiz would all, I’m fairly sure, fit into the “Heart of Algebra” category that will be so heavily emphasized on the new SAT. Obviously, without even a full practice test released yet, it’s tough to know for sure if I’ve got the style right, but based on what I’ve seen, you’d better be able to cruise through these if you’re planning to take the SAT after January 2016. This content is for Math Guide owners only. College Board released a bunch of sample questions this week for the new PSAT and SAT, which will make their debuts in October 2015 and March 2016, respectively. Over the next few days, I’ll be making posts working through each question, a few at a time, and commenting on them when I feel like I have something insightful to say. In this post, I’ll deal with questions 13 through 18 in the “calculator not permitted” section. For the “calculator permitted” section, see questions 1 through 5 here, 6 through 11 here, 12 through 15 here, 16 through 20 here, 21 through 26 here, and 27 through 30 here. You can see questions 1 through 6 from the “calculator not permitted” section here, and 7 through 12 here. So you know . That means a must equal 6. Is this new? Yes. 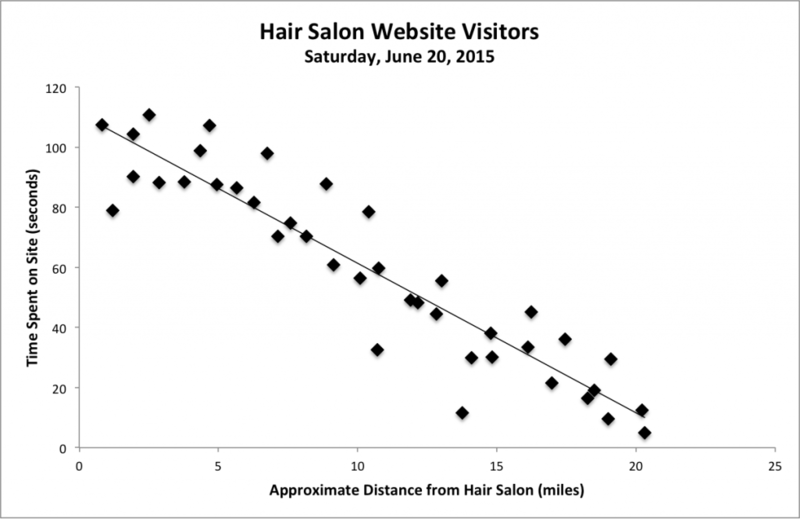 The current SAT generally stays away from work/rate problems. This is another one of the “new” questions that appeared in the first document we got about the new SAT months ago. I hated it then, and I still hate it now. The basic idea is that you need to see, from the right-hand side of the equation, that the equation is telling you how much the printers will print in 1 hour, which is of the job. From there, you need to recognize that each fraction on the left represents one of the two printers. From there, hopefully it’s intuitive that the represents the slow printer, and the represents the fast one. Is this new? Not really—It’s basically a right triangle question. The only thing new is that the current SAT doesn’t have chord as part of its vocabulary. 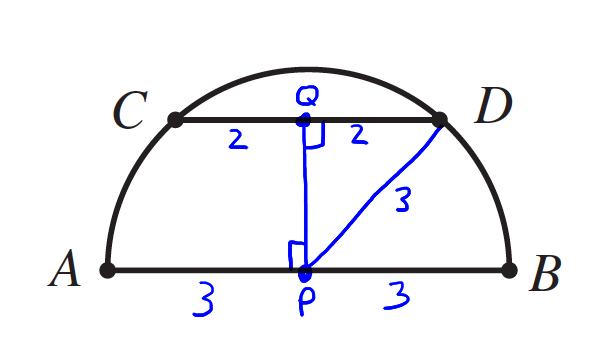 Of course, since PD is a radius, it has a length of 3 just like AP and PB. Only one answer choice has in it, so we can feel pretty good about choice D without even doing the last step of the plugging in process, which is to put 3 in for r in each answer choice. Of course, when you do, D is the only answer to give you . Is this new? Yes. There is no trigonometry on the current SAT. A calculator would be nice here—plug in, graph, and you’re done. Without a calculator, you need to know the relationship between angles with opposite sines. Since the sine function has a period of 2π, subtracting π from x inside the function will result in a negated sine. You might recognize that this really ends up being a graph translation problem. The red graph shifts the blue graph π units to the right (if we had added π and shifter π units to the left we would have had the same result). Is this new? Yes. There are no circle equation questions on the current SAT. This could appear on the current SAT Math Subject Tests, though. 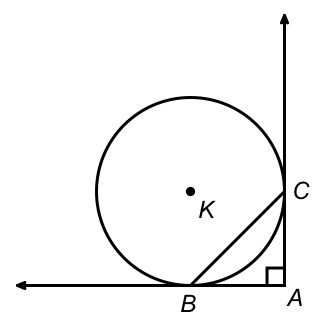 A circle with radius r and a center of (a, b) has the equation . You also need to know how to complete the square, because otherwise you’re not going to be able to wrangle what you’re given into that form. Now, what binomial square begins with ? What binomial square begins with ? is the beginning of the binomial square. So, to complete those squares, we need to add 9 and 16 to both sides of the circle equation! 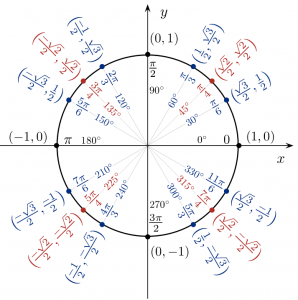 So we have a circle centered at (3, –4) with a radius of 13. The question asked for the diameter, though, so the answer is 26. Is this new? Not really. The algebra is trickier than you’d see on most current SAT questions, but I would not be surprised to see this as a #18 in the current SAT grid-in section. x could equal 7 or 5. In this post, I’ll deal with questions 7 through 12 in the “calculator not permitted” section. For the “calculator permitted” section, see questions 1 through 5 here, 6 through 11 here, 12 through 15 here, 16 through 20 here, 21 through 26 here, and 27 through 30 here. You can see questions 1 through 6 from the “calculator not permitted” section here, and questions 13 through 18 here. Is this new? Kinda. The vertex form of a parabola has shown up (rarely) on the current SAT. And here we see that the new SAT will expect you to know the vertex form of a parabola. Only one of the answer choices is in vertex form, so if you know what that looks like, you don’t even need to confirm that it actually has the right numbers in it—you just need to recognize the structure. Not sure how I feel about that. For constants a, h, and k, the parabola will have its vertex at . If you’re nervous about whether and are equivalent, you can do some algebra (CB walks you through that in the answer explanation) but I’m sticking to my guns—if they’re going to make it so that only one choice is actually in the right form, then you don’t need to bother checking. Is this new? Very much so. Imaginary. Numbers. On the SAT. My whole world is turned upside-down. No, seriously though, this stuff is easy if you know how to FOIL. All you need to do is remember, at the end, that . Is this new? Not really. The current SAT doesn’t usually ask questions that require this kind of equation solving, but it’s not unheard of. Good ol’ fashioned algebra, here. Finally! Is this new? Kinda. Systems of equations on the current SAT can almost always be solved easily in one or two steps. This is not that kind of systems question. Now add that to the second equation to eliminate the y terms and find x! So what’s xy? Well, it’s . After the last two questions, I kinda feel like they’re joking with this one. Multiply that all by 6 and, well, you’re done. Is this new? Yes. Trig doesn’t appear at all on the current SAT. And we get to finish this post up with some trig! Wahoo! There are a few ways to go here. One is to know your unit circle well enough to know that choices A, B, and D don’t make sense. Honestly, that’s how I thought through this when I first looked at it.